Three days of live paintings. The first edition of the Trublyon Street art festival takes place this week end (Friday 15 to Sunday 17 September 2017) in former junior high school Maurice Scève (Lyon 4). Five Colombians and 5 French street artists are invited to express their art on white walls. This new festival is due to local artist Cart’ 1, who had already organized a jet stream weekend in 2016 at the same location during the Wall Drawing exhibition at Musée d’art contemporain. More than 3000 people had come to see artists painting live, to the sound of DJs. 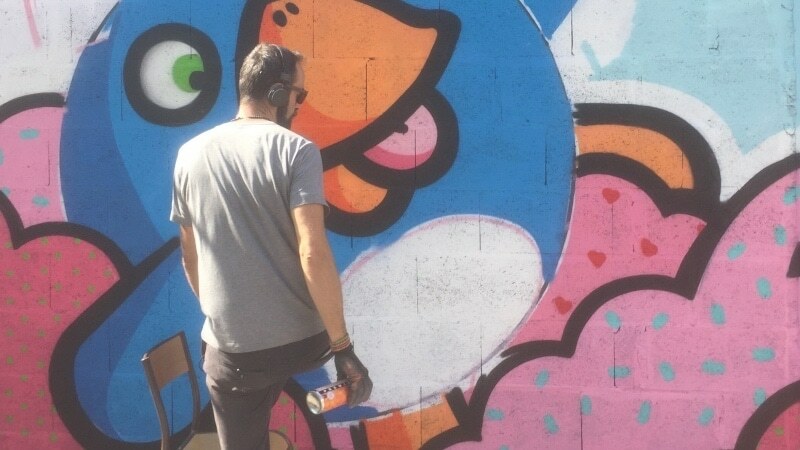 This year, as part of the France-Colombia Year, he invited five urban artists from Bogota, Barranquilla, and 5 from Paris and Lyon to paint on the walls, including Guache, one of the most famous Colombian street artist and PEC, well known in Lyon for his Birdy Kids paintings. Every day, the 10 street artists will create paintings live in a block party atmosphere provided by more than 20 DJs who will take turns over the 3 days. Cool bar, Colombian food, relaxation area and graffiti workshops for kids (11am to 2pm) and adults await you! Collège Maurice Scève, 8 rue Louis Thévenet, Lyon 4. Subway C, Croix-Rousse station. Where to see street art in Lyon?